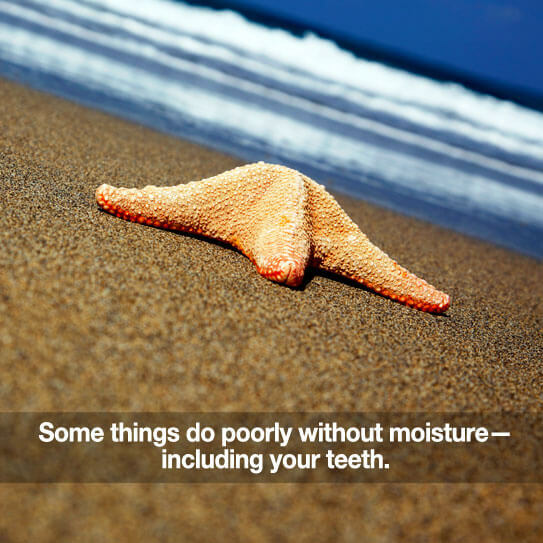 If you are having a lot of trouble with dry mouth, give us a call. You may also want to consult your physician about trying different medications or adjusting your dosages. Thanks for reading our post! Please share it with others who could benefit! Our goal at Stadium Dental Center in Jefferson City, Missouri is to help your smile stay beautiful and healthy. 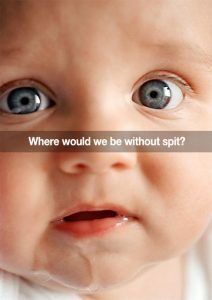 YOU PROBABLY DON’T OFTEN THINK ABOUT YOUR SPIT (and frankly, we’d be a little worried about you if you did). And yes, drooling babies are a nuisance. But did you know that saliva is a critical component for healthy teeth and great oral health—regardless of your age? Here at Stadium Dental Center in Jefferson City, Missouri, we’re concerned about BOTH your teeth and your complete oral health. We thought you may find it interesting to learn how saliva helps keep your mouth protected and healthy, even when we’re not around. Thanks for the continued trust you place in Stadium Dental Center! We appreciate you. Is there any oral health risk connected with marijuana use? The short answer is yes. In fact, several aspects of oral and general health may be impacted. Studies of marijuana users have shown higher gum disease rates. One study found a tripling of the incidence of significant gum disease sites. There was also a big increase in the earliest signs of gum disease. These effects were attributed to pot use after other known risk factors were accounted for. 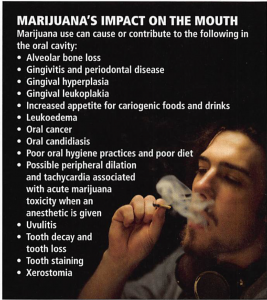 Tooth decay is another impact linked to marijuana use. Both the prevalence and the severity of decay are much greater among pot users. The drug triggers neurotransmitters which produce cravings. Users try to satisfy such urges by consuming foods that promote tooth decay. Cancer found in the head and neck has been shown to be over 2.5 times as likely among marijuana users. This effect is in addition to those from other risk factors such as tobacco and alcohol use. Because of riskier behaviors when under the influence of marijuana, HIV infection has also been found higher among users. The substances in marijuana contribute to the buildup of greenish-brown tartar on the teeth. This makes the appearance of the teeth unappealing. Removal of these unsightly deposits is more difficult for the dental team. For these reasons, we have an interest in honestly inquiring about marijuana use (as well as other substances such as nutritional supplements and herbal medicines). This is a part of our health history and oral examination process for both current and new patients. Our intent is not to violate your privacy. To provide you with the best dental care we can, it’s vital that we confidentially assess your risks, including marijuana usage.